Business Services – Copy & Mail Etc. From advertising materials to print solutions for day-to-day business operations. From Business Cards and Flyers to Self-Inking Stamps, Letterheads and Envelopes. Give your business an edge with our expertise in business printing services, from concept to completion, our staff is here to help. Come in our store with your ideas and inspiration and we will print it on paper with your very own personal touch and style. Following is a list of print products and services we offer for business. Color Copies Full-color laser copies. Cost-effective alternative to color printing for smaller quantities. Starting as low as $0.35 per page. Check out our monthly flyer for exciting deals. B/W Copies Suited for both small & big print jobs. Variety of paper stocks, sizes and colors available to produce crisp and sharp b/w copies. Starting as low as $0.03 per copy. Check out our monthly flyer for exciting deals. Business Cards Full-color or B/W…the choice is yours! Get it custom-designed and add personality to your business. 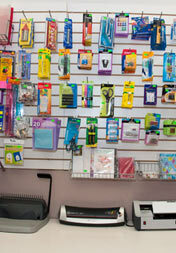 Variety of card stocks and quantities available to suit your needs. Make an impression with newer products like plastic business cards & 16pt card stock. Starting as low as $25! Check out monthly specials! Feature Sheets Real Estate Agent’s favourite print marketing tool to sell properties. Open House this weekend? 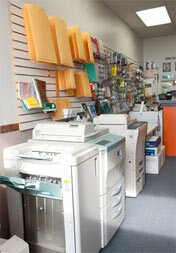 Call our store and let our friendly staff help you print sharp, crisp feature sheets in an instant! Low quantities OK.
Brochures Create neat and handy Price Lists for all your business services and products on a 3-panel brochure or simply run monthly or quarterly full-color product promotions. Use glossy stock for maximum impact. Custom quantities available. Competitive pricing and satisfaction guaranteed. Letterheads & Envelopes Big on traditions? Use linen or parchment letterhead complete with your company logo, slogan and address for all your business correspondence. Include a matching envelope and let your mail truly stand out. Carbonless Forms Business forms produced in multiple parts/copies with or without numbers. Various sizes and colors available. 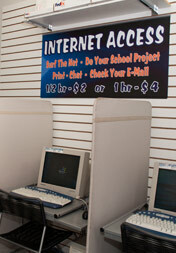 Popular with doctor’s office, schools, banks, machine shops etc. Call store for details and a quick quote. Post Cards Promoting an upcoming fundraiser event? A music concert? A surprise birthday party for grandma? Full-color postcards can be used for these and a lot more. Bring your ideas and event details to us and we will create and print on a 4×6 or 5×7 postcard for you. Low quantities accepted. Flyers Get your business message across with professionally designed flyers filled with pictures, texts and graphics. Various size, stock, quantity, and color options available. Get 500 flyers for only $30 dollars! Invoices A very popular type of business forms produced in singles or multiple parts/copies. Custom-made to include your company information and common product/service types pre-filled. Various sizes and colors available. Gift Certificates Celebrate special occasions/holidays and customer appreciation weeks with custom gift certificates promoting your products and services. 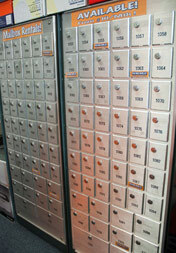 Various sizes, colors and sizes available to suit your business needs. Catalogues Full-color or B/W. Choice of stocks, sizes, page combinations and quantity options available. Custom designing. Presentation Folders Effective marketing tool when used in conjunction with letterheads, flyers, gift certificates and business cards. Get company logo printed in full-color on the front of the folder and let your business presentation truly shine! Self-Inking Stamps Get used to the ease and comfort of self-inking stamps to print repetitive information like dates, return address, signs, tax numbers, company logos etc. Can be custom produced to various shapes, sizes and colors. Security Cheques Our Supreme Security Cheques incorporate 6 Security Features to provide a high level of protection against fradulant activity. Defend your business from cheque fraud. We can also include you company colours & logo. Store-Front Signs Whether your business is in a strip plaza or inside a shopping mall, our store-front sign products generate maximum visibility/customer traffic. We design & install PVC/Metal/Wood and Illuminated Channel Letter signs. Lawn Signs Very popular form of seasonal & outdoor advertising with general contractors and tradespersons. Weather resistant and light weight with full color graphics. Low quantities accepted. 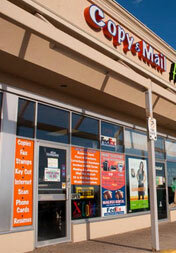 A-Frame Signs Generate extra walk-in traffic in your store with these effective outdoor/indoor signs. Metal construction with full color graphics on corroplast boards that can be reversed to display multiple product and service messages. Banners Popular sign option for businesses on budget. Outdoor/indoor application with easy to store, clean and carry. Produced on vinyl with full-color graphics. Starting as low as $65 for a 2’ x 2’ vinyl banner. Magnetic/Decals Ideal for car, truck or van. Can be permanent (decals) or apply/remove at will (magnetic). Full-color graphics. Web-presence for businesses today is synonymous with having a corner store that is open 24/7 but with one small difference… A customer base that potentially expands from the corner to half a world away. At CME, our team of web-savvy and experienced web-designers assist our clients with all stages of website creation, hosting and content management. We also offer graphics services that include logo creation, business card/flyer/brochure design and a whole lot more. For your next graphics/website project, give us a try… We promise we won’t disappoint.